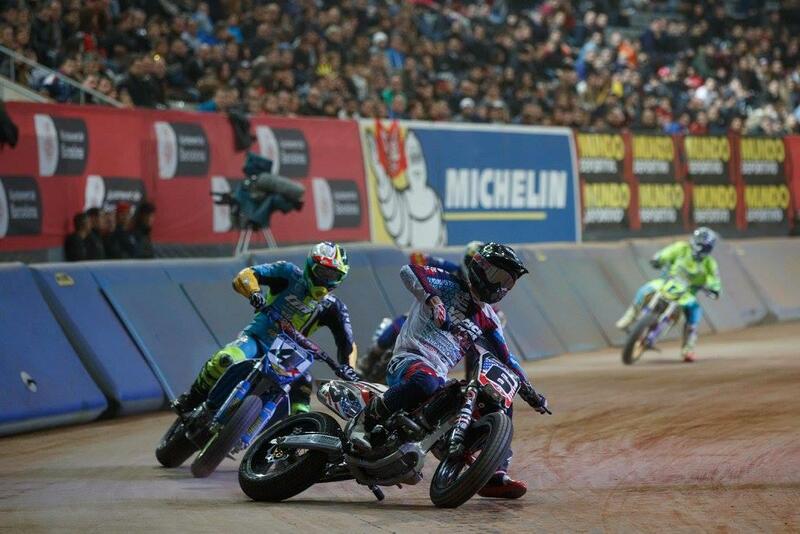 Former AMA Pro Flat Track Champion Brad Baker has jokingly admitted that he might need to stop sharing his knowledge with his European rivals, after MotoGP world champion Marc Marquez beat him to the win during Saturday night’s Superprestigio race in Barcelona. The American has been a big proponent of the expansion of the sport in Europe since Marquez first invited him to the inaugural Superprestigio race back in 2012, and since then has spent considerable time on the continent helping to coach not only Marquez and his Superprestigio rivals but also the guys lining up for the new Spanish championship. But after Saturday's defeat at the hands of both Marquez and fellow Grand Prix racer Toni Elias, Baker says that maybe it’s time for a new strategy! “People keep saying to me ‘don’t show all your cards!’ I’m going to have to start going slower, to playing mind games with them now! I’m going to have to work harder to become better myself too, but it’s not easy, because these guys train track racing, supermoto, motocross – and I’m riding on bigger bikes on longer tracks. They only do it a little bit of their year, but so do I, and I can’t commit to putting all my eggs in a 450cc basket on a short track. However, Baker might find the challenge even harder next year thanks to a switch in the rules for the American series. Traditionally run using both big twins and smaller single cylinder 450cc bikes depending on the type of circuit, new rules for 2017 will see him competing only on the twin machinery, limiting his time on the smaller class to just Superprestigio.